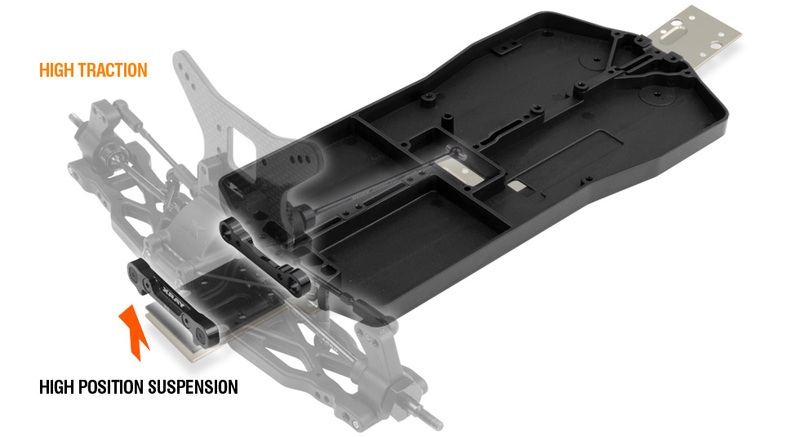 The new composite chassis frame has a split design with a separate front part and rear chassis plate. The split design allows the entire rear suspension to be mounted in either standard position using the rear chassis plate, or to be placed lower by mounting the rear suspension directly to the aluminum chassis. 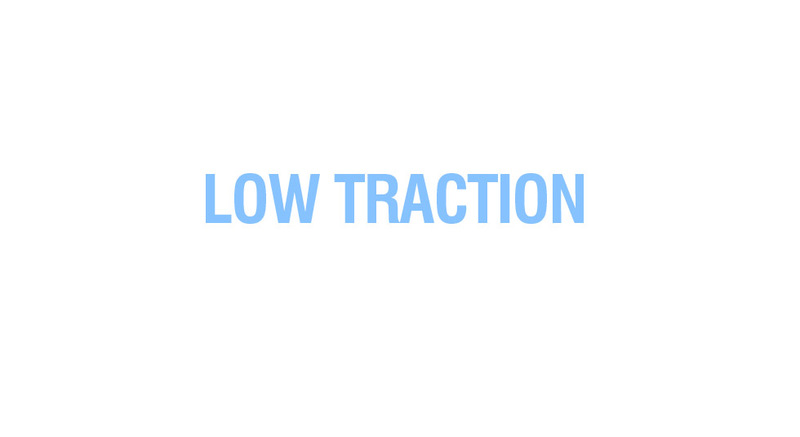 The direct mounting of the rear suspension increases traction and is recommended for low-traction tracks. 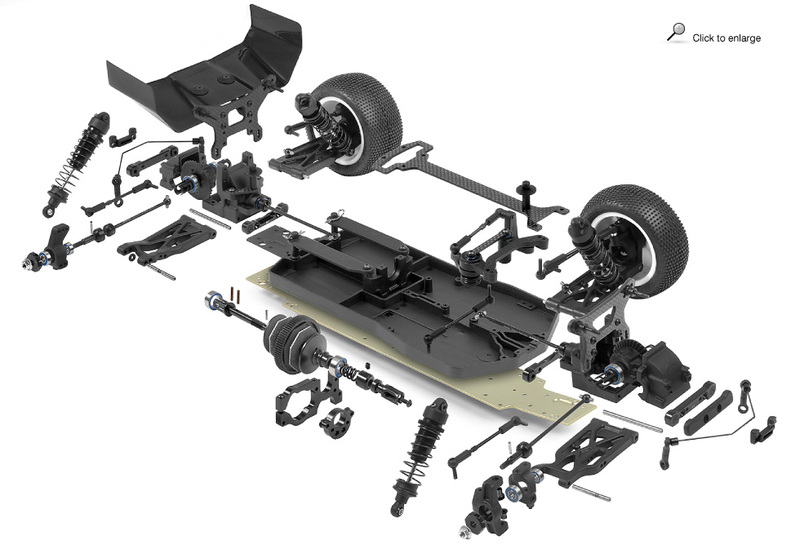 Mounting the rear suspension directly to the chassis requires optional rear suspension holders 363311 & 363321. 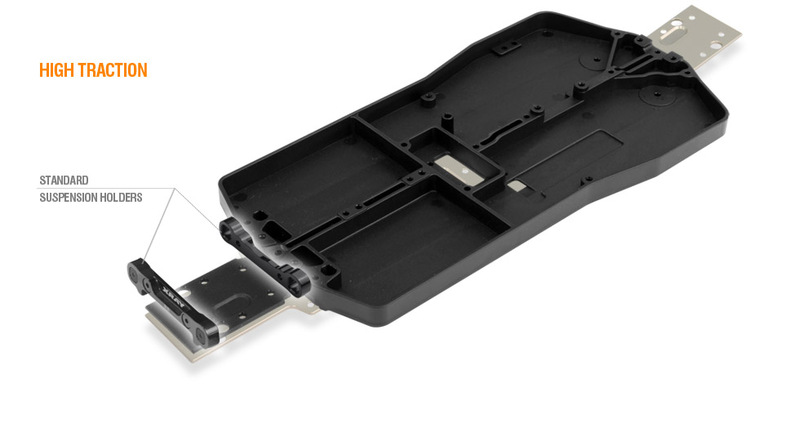 The split chassis is compatible with both XB4 & XB4 2WD. quick and easy weight balance adjustment. All-new arms feature the innovative SFA™ (Suspension Flex Adjustment). 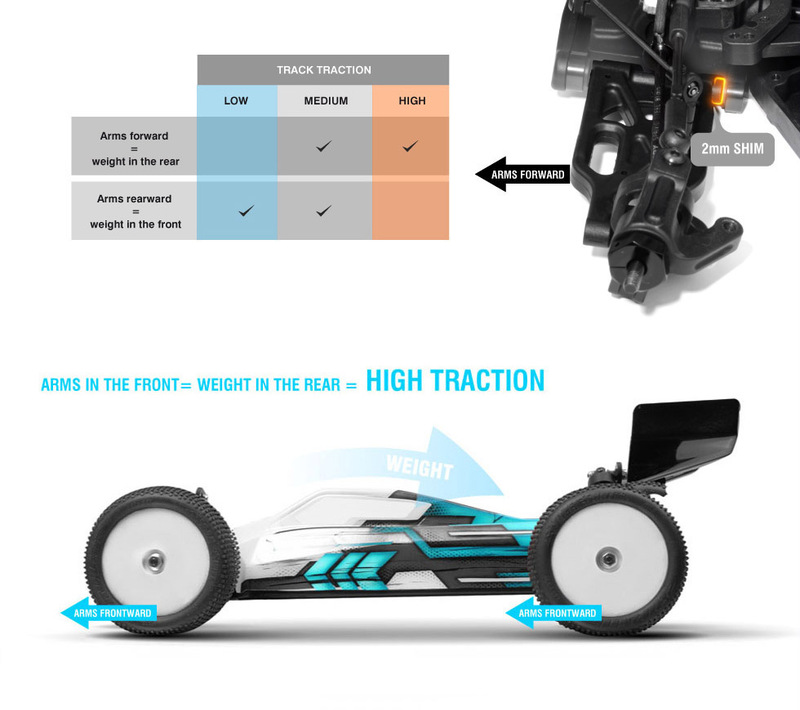 Whether you are racing in low- or high-traction track conditions, you can easily adjust the flex of the arms by quickly and easily adding optional graphite stiffeners which change the stiffness of the suspension. The new arms include 4 holes where the optional graphite stiffeners are mounted, and the areas around the holes are strengthened for maximum durability. All-new innovative and unique SFA™ graphite stiffeners allow for super-quick suspension flex adjustment to easily adjust the traction of the car in various track conditions. Whether you drive in low- or high-traction conditions, with the smart graphite stiffeners you can very quickly and easily adjust your car to suit current conditions. At the beginning of a race event when traction is low, the arms are used without the SFA™ graphite stiffeners. As traction increases, the suspension can easily be made stiffer by mounting the SFA™ graphite stiffeners for more stability and easier driving characteristics. The graphite stiffeners give the car maximum stability in chicanes and allow for easier and smoother steering. Made from 1.6mm thick high-quality CNC-machined graphite material, the stiffeners can be easily mounted or removed by only a few screws. 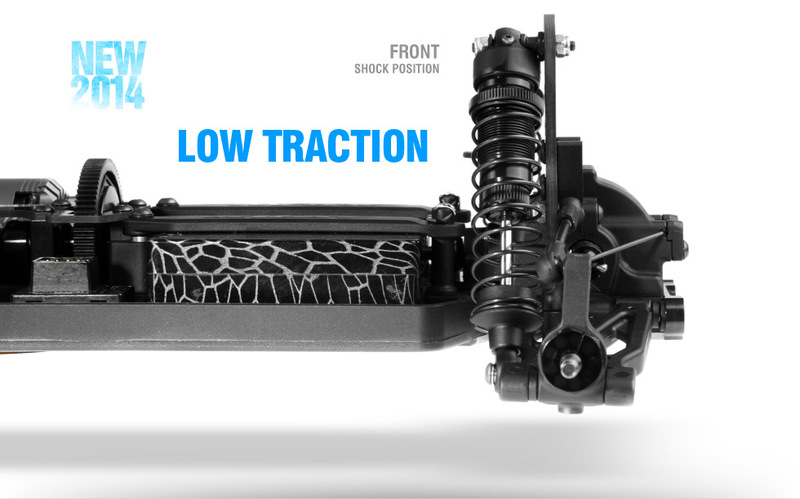 All-new suspension arms are narrower which allows for quick and easy wheelbase adjustment. 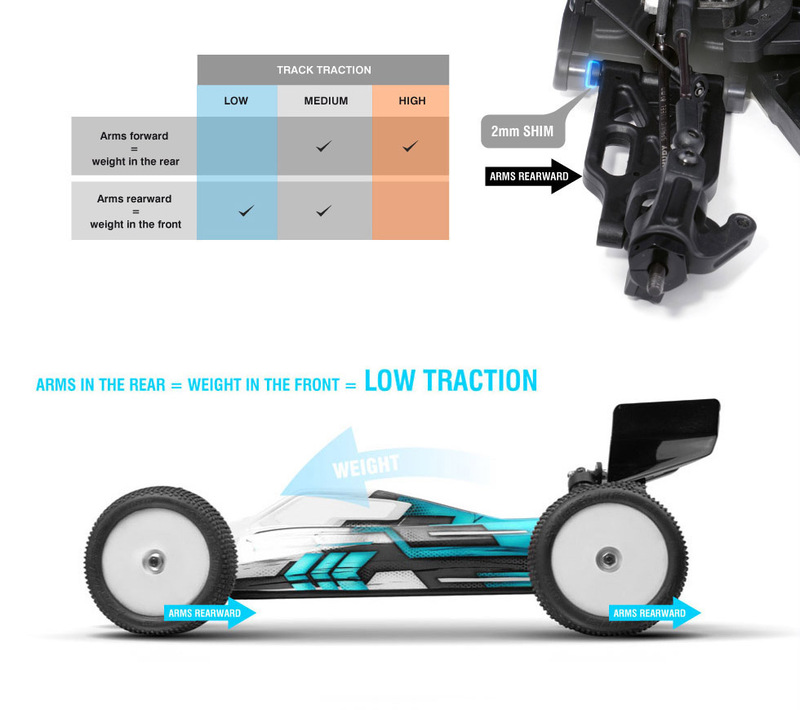 Using included 2mm shims, both front and rear suspension arms can be moved either forward or rearward to adjust weight balance depending on track conditions. By moving the arms to the front, the balance and weight of the car are transferred more to the rear; this is recommendedfor medium– and high-traction conditions. By moving the arms to the rear, the balance and weight of the car are transferred more to the front; this is recommended for medium- and low-traction conditions. The wheelbase shims allow not only to move the suspension forward/rearward, but also allows the wheelbase to be adjusted shorter or longer for fine set-up tuning under various track conditions. The power from the motor is transferred to the drivetrain via an adjustable central slipper clutch for quick and easy tuning. The new lightweight slipper clutch plates have a machined relief which decreased the friction surface which assists with clutch slip adjustment. With the new plates the pressure of the plate is on the circumference of the clutch pads, which increases the efficiency. The new slipper clutch pads are produced from new ultra-efficient SLS material with very high slip efficiency and allows very precise adjustment of the slipper clutch. The new clutch spring is much stronger which helps improve consistency and gives ultra-fine slipper clutch adjustment. The new front wheels feature +1mm offset which makes the front of the car wider and as such more stable. Front & rear bulkheads were reinforced to withstand rigorous impacts and abusive racing conditions. The diameter of the holes for ball-bearings was refined to minimize ball-bearing play which results in increased lifetime of the gear’s teeth and minimizes the gears stripping. Front & rear shock towers were redesigned and reinforced. Machined from premium-grade 3.0mm graphite, the shock towers are lightweight and strong and have multiple shock positions as well as multiple roll center adjustment positions. The rear shock tower holds the wing mount. 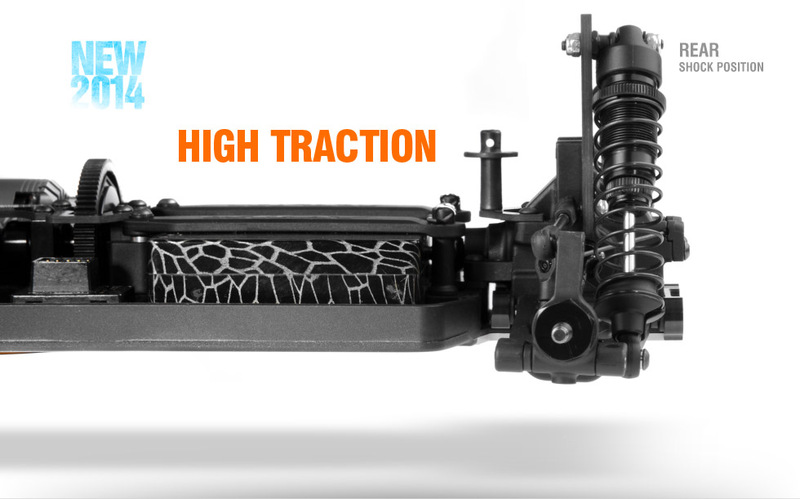 Both front & rear differentials feature new reinforced diff outdrives to increase reliability. To increase lifespan and reliability, both front & rear differentials include new reinforced diff bevel gears. All feedback was considered and evaluated, and even the smallest details such as ball joints were refined and improved. To increase reliability, the ball joints were redesigned and reinforced. To new top deck was reinforced for increased reliability and other small details were improved for a more precise fit. The top deck is machined from high-grade graphite, and its main design purpose is not only to hold the body mount but also to reinforce the chassis assembly by connecting the front diff bulkhead with the central drive system. The top deck captures the central drivetrain bearings and holds them in place in their supporting bulkheads. To improve shock sealing, the upper cap O-rings are included in the shock absorbers. In addition to the new front shock tower reinforced design, the XB4 includes an additional shock tower protector which can be used at extremely abusive tracks. The optional ball differential was designed and is suggested for low traction track conditions. Externally adjustable ball differential is machined from HUDY Spring Steel™ and additionally hardened for extra durability and long lifetime. High-quality carbide thrustbearing is included for smooth operation and the carbide balls ensure ultra-smooth running. The ball differential comes factory pre-assembled..